Home » books » Do you want new books? I hope my name mate Diane of Lavender Dreams and Ricki of Art at Home would be able to read this post. Few weeks ago, I shared Book Sneeze, a website where book lovers and bloggers can receive free copies of books in exchange for a review. If you are interested to join Book Sneeze, click this previous post. This afternoon, I discovered another site that caters to all book lovers. While Book Sneeze requires a blog and prior approval for membership, this site does not. 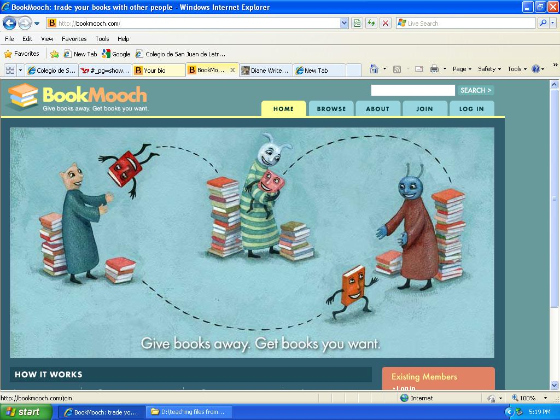 Book Mooch is a community that facilitates the exchange of books among book lovers. If you have books which you no longer use and would like to trade them for new books, then this site is for you. Signing up for Book Mooch is easy and no blogs or any evaluation is required. All they need is a valid email address and some of your personal information. I joined Book Mooch and I currently have four books in my inventory. You can view my profile and my books in this link. If you want any of my books, then sign up and submit your request. This sounds like such a good idea. I'm hoping that one of these days I'll have time to actually sit and read a book. It takes me weeks just to get through a magazine these days...a little here and a little there. Thanks for popping in to see my new Rooster.